Would you rather work with people or machines? This is a difficult question for an introvert, as people and interactions can frequently be uncomfortable and draining. For farmers, people who generally are happy to be farming because of a minimum of human interaction, it poses similar difficulties. In The Four by Scott Galloway, he makes note that Jeff Bezos suggests having a minimum payout “salary” to people. A concept that many of the left cheer out, but if the idea is considered, reveals reasoning that is cause for shuddering. Jeff Bezos is arguably one of the most forward thinking CEO’s currently living. He and Amazon are pushing the boundaries of what an online retailer can do. If he is suggesting something of this kind, he very likely is envisioning a world where lower-tier employment is no longer an option. A world where there are no cashiers or low wage paying positions of similar kinds left, because of increased automation. The signs are already showing in some places. Have you been to Walmart recently? Quite conspicuously there has been an increase in self-checkouts, reducing the required cashiers to function efficiently. Amazon themselves are experimenting with something on a higher level: Stores without cashiers or registers of any kind. They have started pickup locations where people can walk in, pick products, and walk out. Their purchases are tracked on their phones and automatically billed to their accounts. It’s not a good time to be a minimum wage employee. On the flip side, there are some companies that are pivoting in the opposite direction, investing in human capital. Best Buy for example, and even Apple retail stores, focus on having trained employees capable of helping and giving a face to the business. In his latest book, Your Successful Farm Business: Production, Profit, Pleasure, Joel Salatin makes this comment about people and the farmer. In a chapter on relationship marketing, he continues to reinforce the necessity of cultivating people skills and relationships on the farm, despite most farmers lacking enthusiasm for the idea. Human capital is the true investment of a farm. 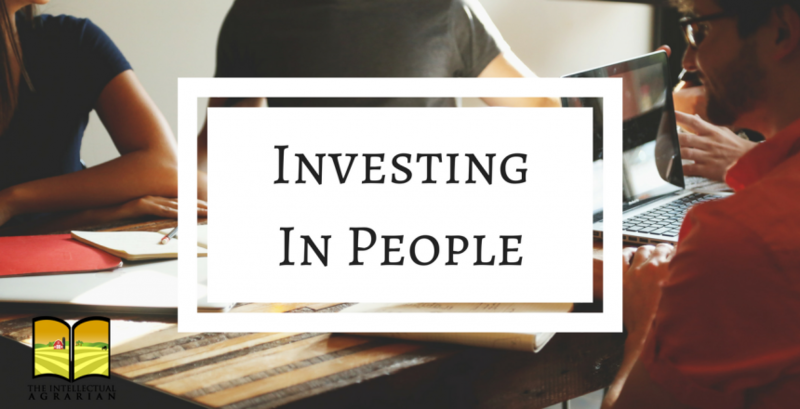 Investing in the customers, employees, and your own knowledge. For several decades, farming has tried to remove the human element from it’s practices. Through industrialization we’ve removed customers, employees, and even our own knowledge from the equation. Opting instead to adopt brokers, service technicians to fix our equipment, and well meaning salesman and intellectuals to tell us what we should do. Joel Salatin once remarked that if he lost his farm, he could start up again anywhere because he has invested in two things more important than the land itself: His knowledge/skills, and his customers. If farmers, small businesses, or employees want to survive in the age of automation and replacement, we need to focus on investing in Social Capital and people. Place greater important in interactions – Even if going through the automated checkout is quicker, take the opportunity to share a smile with the person at the cash register, they might need it. Support people, not companies – This can be very difficult in the age of Amazon. It’s so easy to find anything you need there instead of looking for a store to purchase it from. Whenever possible look for ways to support a person instead of a company. Shopping locally is probably the easiest method, frequent the local restaurants and coffee houses where you are a regular instead of a statistic. Build your network – Most people, naturally inclined to socialization or not, ignore their networks a good deal of the time until they need something from them. Dig the well before you want a drink, whenever possible, reach out to the people in your network to give some value. Add to their lives without expecting anything in return, you’ll be amazed at the results.